If you haven't seen the movie yet, watch the second official trailer below and then go see the film. The rest of this article (after the video below) is filled with spoilers as I really want to share my thoughts about the good and some minor issues I have with the film. If you enjoyed The Avengers then this film is easily that good with a more surprising plot that won't leave you feeling short changed (like the Mandarin plot twist of Iron Man 3). I'd go so far as to say it's the first Marvel film in this MCU series that encourages you to think a little harder whilst still allowing you to enjoy the ride. I'd also say that this movie is as close to a direct sequel to The Avengers as you can get without all of the Avengers assembling. Spoilers from here on. You have been warned. Right off the top I'm going to address the elephant in the room and go off on a tagent. With all these post Avengers films it always makes me wonder, where are the other Avengers? Sure Tony Stark turned all his suits into a firework display in Iron Man 3 but not a single Avenger even checked in on him or was concerned about the Mandarin during that film. Not so much as a SHIELD agent showed any concern... yet SHIELD was all over him in Iron Man 1 and 2. Thor, The Dark World takes place over a single day - which is the excuse given for the lack of SHIELD agents in that film... and I guess Stark was still building a new Iron Man suit, but what about War Machine a.k.a. The Iron Patriot? That leads me in to Winter Soldier which takes place over three days. Which is the flimsy excuse given for a no show for the other Avengers. However, we've all seen how quick Tony can get into an Iron Man suit and fly half way around the world to Afghanistan... and again, if he doesn't have suits, what about War Machine? I'm prepared to give Hulk a pass because MCU Bruce Banner is some what a reluctant hero still coming to terms with where the Hulk fits in. He seems more interested in finding a cure for the Hulk than becoming a superhero. Hawkeye is part of SHIELD. I've heard a scene was filmed for Winter Soldier but was cut that explains his absence. Fair enough. Which leaves Thor, the Earth's defender supposedly, who is a no show when it comes to protecting Earth from its self apparently. As mentioned, his movie took place over a day. He had no trouble travelling between realms in that time. Anyhow, fortunately we got more Black Widow, Nick Fury and even got a new hero, the Falcon. I'm not disappointed at the low Avenger count in Winter Soldier, I'm just sayin'... when these characters exist in the same continuity you do wonder where they are? Especially when it's SHIELD that is imploding. One of my favorite things from The Avengers movie was the Helicarrier. The reveal of the new Helicarriers - now with new Stark Industries Jet Turbine engines - early on in Winter Soldier is one of the first clues that something isn't all that right with SHIELD. It was cool to see them and I immediately thought... they have a lot more gun turrets than I remember. By a lot more I mean... is there an invasion that'll make the Battle of New York seem like 'Tuesday' coming that we don't know about? I did like Cap's new SHIELD uniform but was glad to see him don his original war time outfit during the final battle of the film. It's still the best Captain America suit design so far. 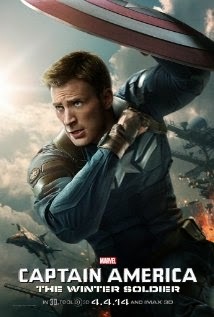 We get to see Cap do a lot of fighting both in and out of uniform, proving that he is Captain America no matter what. Unlike Tony Stark who needed a whole movie just to figure out he is Iron man. What's great about Cap's fights is they always seem totally believable for him and his abilities. Even when he jumps off of multi-story buildings to ground level without breaking stride. Not only that, even though his shield's physics and how he uses it are total nonsense, you totally buy into it. Cap can work out in an instant just the right point to bounce that shield off for it to lodge in an engine or take out a bad guy and have it return to him afterward on occasion too. The humor of this movie isn't forced at all. I definitely appreciated Black Widow's multi-tasking, trying to fix Steve Rogers up with a date during a covert operation - great character interaction and great action at the same time. More of that please. Falcon was a great addition to this movie though he did feel a little out of his depth in terms of his action sequences. The Winter Soldier really took him down without much effort (as he should). However Falcon's alter ego Sam Wilson was a good fit as a friend to Steve Rogers and will be fun to see continued into future films. Probably the worst kept secret of the film was Bucky's return as the Winter Soldier. Although he has title billing he's not really the main villain of the film. That said he really is played by Sebastian Stan as a very believable 'force of nature' style villain. Every encounter with him didn't seem to slow him down much at all other than to delay his mission. It really seemed like even Captain America had no clue on how to break him. That said, Steve Rogers attempts to find Bucky underneath the hard exterior draws a lot of similarity to Luke Skywalker's attempts to redeem Darth Vader in Return of the Jedi. Though it's probably closer to RoboCop's attempts to rediscover his humanity and the person he used to be in Bucky's case. Either way, it's not a problem with the plot and I like that it wasn't the main focus of the film. More of a side plot that looks as if it'll feed into a future film. The whole take over of SHIELD by HYDRA was a plot twist I didn't see coming (and really made all those guns on the Helicarriers make sense). The most awesome thing about it was that HYDRA was revealed to have been infiltrating SHIELD from the very beginning. In doing so you suddenly start to think about all the Marvel movies from phase 1. Particularly the first Captain America movie and to a lesser extent the Iron Man films and their references to Howard Stark. 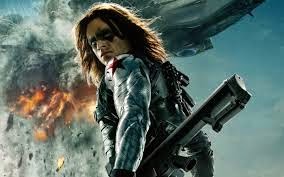 With one idea, HYDRA infiltrating SHIELD from the beginning, The Winter Soldier becomes an important tent peg movie of both phase 1 and 2 Marvel films. In fact this movie changes the course of everything in the MCU. Will be interesting to see if the outcome of this film has any influence on The Guardians of the Galaxy due out in August or whether that movie will be more stand alone and the Avengers sequel is where the story continues. 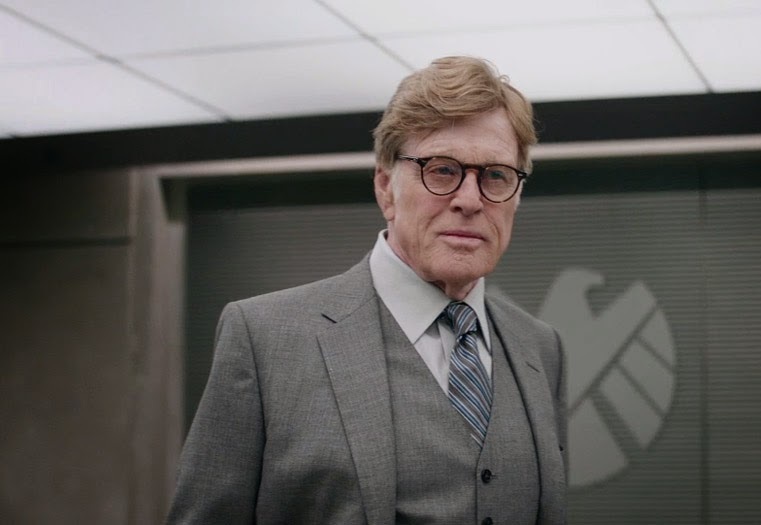 I really enjoyed the HYDRA plot twist and was among the many people relieved that Robert Redford's character didn't reveal himself to be the Red Skull. If he had, I'm sure that would've been done well but I kind of liked Hugo Weaving in the role. I think it's highly possible, if Bucky can return, the original Red Skull can too. One minor irritation I had was the 'magic hole digger/cutter' equipment that both Nick Fury and Maria Hill use to escape vehicles by the sewer system (presumably). This equipment is never seen or explained and seems a very convenient plot device. It turns out Fitz (from the TV show Agents of SHIELD) invented this device - which was never given to regular SHIELD Agents - hence the lack of wide spread use. I can give a pass for all that but why does no one ever seem to follow the people down the hole? Did I miss something? Does the hole fill in again? My other issue is with how just three people can take down three Helicarriers just by changing a circuit board located conveniently in the underside of the carriers. Admittedly the three are not ordinary people but who the heck designs a massive warship with such a flaw as a single circuit board can retarget all the weapons? ...and, if you do, put it somewhere a bit more protected. There's probably a lot more I could mention that I really liked about this film and not too much that I didn't. Of the phase 2 Marvel films it's the most satisfying in terms of its place in the MCU and evolving the story post Avengers. It also makes Captain America one of the most interesting characters in the MCU. You really hope that he finds out what it is he wants to do - you know, when he's not being a superhero.